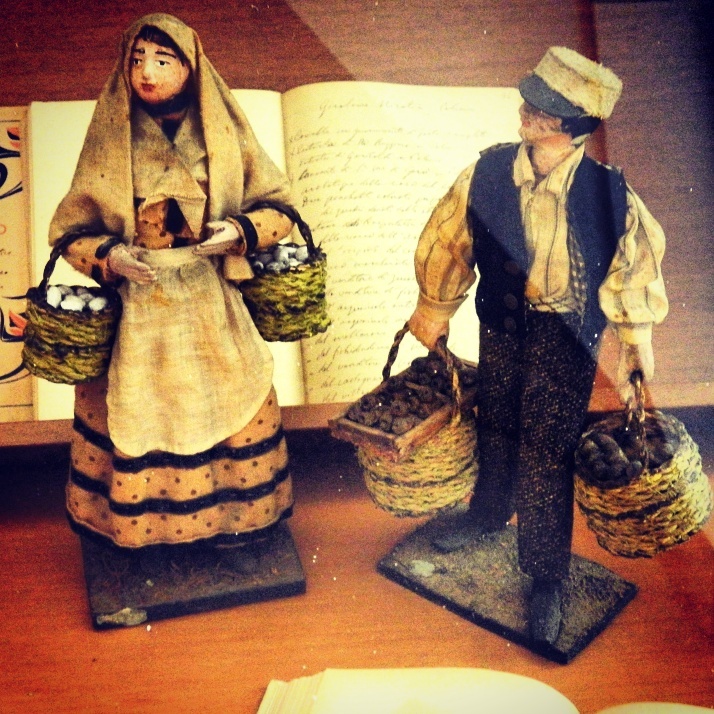 These two figurines from Palermo’s Museo Etnografico Giuseppe Pitrè are carrying traditional baskets filled with foodstuffs. The woman carries eggs, and the man, it’s hard to say. I’m going to venture to guess that perhaps he’s carrying chestnuts or “castagne.” This is the season for harvesting chestnuts–and like the olive festivals also celebrated in November, in the community of San Salvatore di Fitalia in the province of Messina, this weekend, they held a Chestnut Festival or Sagra della Castagna. During the days, an outdoor market gave townspeople and visitors an opportunity to purchase local products such as chestnuts, hazelnuts, mushrooms, honey, olive oil, boar (Sicily’s particular Nero dei Nebrodi black boar), salami, preserves, wine, and cheeses. Folk music and dance groups performed in the town piazzas and historic center. Nature walks and horseback rides gave revelers an opportunity to see the chestnut trees up close, and a mass celebrated the bounty of the harvest. The weekend closes tonight with a buffet of desserts featuring chestnuts as the main ingredient. I don’t think I’ve ever eaten chestnuts. Now I’m curious! This sounds like another delightful festival connected to food and worship. Very interesting.